When the police station door closed behind me it was like my whole world changed. For whatever reason everything that had been driving me nuts for months suddenly vanished from my thoughts. It was like they were all standing on that preciface and watching me as I fell. All those anxious thoughts and painful tasks that I hadn’t done were left behind and I was solely thinking about the decision I had made to walk out. For me it was an unusual feeling as everything vanished from my brain as I tried to contemplate what I had just done. The decision itself wasn’t a big one but the ramifications for me meant that I was now on a slipery slope and I was struggling to get any sort of realism into my thoughts. I didn’t know what to do. My whole world was now confined to what was between my ears and nothing else mattered. As I stepped off the sidewalk and onto the road I began to cry trying to grasp the concept of what I had done and what was now happening. My first thought was to try and avoid anybody that I knew. I knew police officers used the carpark and I tried to think of ways to walk without bumping into someone and them asking me where I was going. I had no idea where I was going so what would I have said to them. I tried to hold back on any emotion until I reach the sanctuary of my car. I threw my bag on the back seat and jumped into the drivers seat. A sense of relief initially came over me but it was short-lived as rabid thoughts took hold. Where shall I go ?…what shall I do ?….I need to hide, but where….I put my hands on the steering wheel and my head on my hands and started to cry. Everything I should of done, phone in sick, phone Katrina, go back to my Aunties never entered my mind. They were not on my list because I didn’t have a list. All I wanted to do was get out of there and be on my own. My head was throbbing at the temples as I sobbed profusely. After several miniutes I got my one thought together and decided to drive. No idea where but I thought driving would at least use other parts of my anatomy and give my brain some sort of respite. I pulled out of the carpark as indecision began running amuck with my brain as I tried to work out which way to go. I decided to head to the motorway as that was straight and I wouldn’t have to think too much. As I drove my hands were at 10 to 2 on the steering wheel and I was sitting forward in the seat. My arms were rigid as I struggeld to hold back the tears…it was useless because I succombed to all out blubbering. As I got to the motor way all I could think about was where I could go. I didnt want to see anyone, I didnt want to be around any people, I just wanted some time to myself where I could try and get some quiet time and I could get what thoughts I had together. 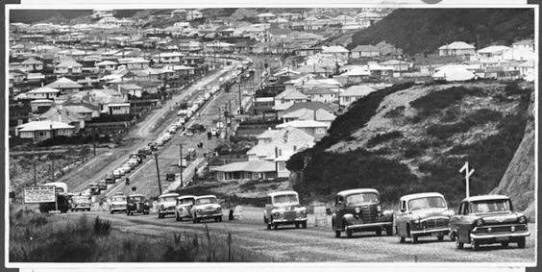 As I drove my mind blasted back in time to my younger days in Wainuiomata when as a kid and I had nothing else to worry about except what my Mum was putting in my sandwiches. I made the decision to drive back to my past and headed over the hill. Coast Road was where I use to live and it was the one place that I knew and where I was confident I could find a place to hide. I couldn’t stop crying, reality was beginning to set in and I couldn’t see a way out of my predicament. It was like all my options had been sucked out of my head and left me with nothing except the moment I was now in. When I got over the hill I drove past all the places that had played a part in shaping me into the person I was at this moment. In an adsurd sort of way it was like watching my life go by as I headed towards what I thought was an unknown future. The thoughts of my past just drove me into a sadder state as I continued to cry while I drove to the end of the Coast Road where I knew any sight of a human being was going to be highly unlikely on a weekday. It was also out of cellphone coverage. ! I drove to the end of the tar-seal and found an empty carpark that looked out over the rugged coast. I couldn’t even make a decision on where and how to park. Shall I park nose in, nose out, was the park flat, was it sloping, could I be seen. After moving about three times I settled for parking in a corner with the nose facing in and facing out towards the sea. I thought about nothing else except what was happening now and the possible ramifications. I couldn’t stop the tears and I was just wanting some sort of respite from the tension that had now taken over my body. I put the seat back into a position where I could lay back and try and get some sleep. I hadn’t slept for months and in the emotional distraught state I was now that wasn’t going to happen without some form of assistance. I reached over into the back seat and grabbed my bag……..